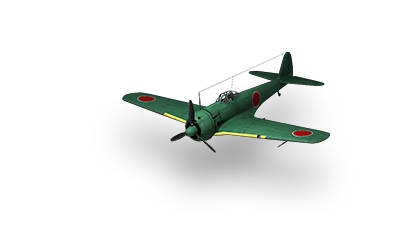 Developed by the Nakajima Aircraft Company to replace the Ki-27 in the Japanese Air Force. First aircraft entered service in the fall of 1941. A total of about 6,000 Ki-43s of various versions were built and used on all fronts until the end of World War II. Worse 20mm guns than the A6M1. 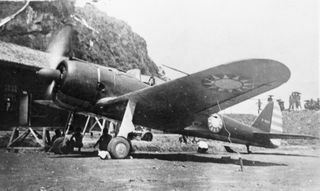 The Ki-43-1 is very light and maneuverable, similar to the A6M1 "Zero". These two aircraft have lots in common but with some differences. The Zero has more guns and slightly more health. On the other hand, the Ki-43 has better maneuverability and engines. Play styles are very similar; use your maneuverability to get behind fighters and shoot them down. Because of the lack of guns, avoiding going after bigger enemies with tail guns is advised. More likely than not, the tail guns will take you out quickly before you can take out the enemy bombers/attack aircraft. Going after other Japanese or Russian aircraft is a viable strategy, since you can outmaneuver everyone else. Doing so could really help out your team as well as keep them off your teammates. Gun wise, the best guns are the 20mm cannons. They do the most damage, but they overheat very quickly. Since you do not have any other armaments besides these, firing in bursts is a must. Overall, a fast and maneuverable fighter that while has very low armor, can be very fun to play. Guns are a must. Research the 12.7mm machine guns and then the 20mm cannons to maximize damage. The Ki-43 (Oscar) was initially produced in November 1939, given the designation Ki-43-I. Deliveries from Nakajima's Ota factory commenced in February 1941. In addition to outstanding maneuverability, the Ki-43-I had an impressive rate of climb due to its light weight. 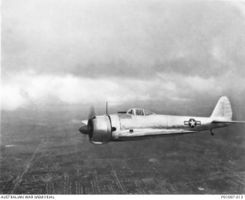 Power was provided by the Nakajima Ha-25 engine turning a two-bladed, two-position variable-pitch metal propeller. Top speed was 495 km/h (308 mph) at 4,000 m (13,160 ft). The Ki-43 was equipped with two synchronized cowling machine guns in various configurations, with either two 7.7 mm (.303 in) Type 89 machine guns, one 12.7 mm (.50 in) Ho-103 machine gun and one 7.7 mm (.303 in) gun, or two 12.7 mm (.50 in) Ho-103 guns; the aircraft was given various sub-designations to reflect these differences. The configuration that appears to have been most prevalent at the outset of the war was the first configuration with two 7.7 mm (.303 in) Type 89 machine guns, while as the war progressed the heavier combinations gained popularity and the version with the heaviest armament was sometimes given the designation Ki-43-Ic. The Ho-103 was often loaded with explosive ammunition to increase target effect; its penetrative effect against later Allied aircraft armor appears to have been marginal. A captured Ki-43-Ib in flight over Brisbane, 1943. 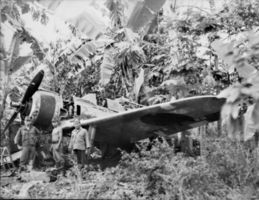 The Flying Heritage Collection Ki-43 at Rabaul, 1945.